Sports stars often become society’s role models, exhibiting the discipline, courage and determination to motivate us in our own lives. For these LGBTQ athletes, the ability to inspire goes one step beyond. When they break down stereotypes, leap over expectations, and lift up their voices, they show that we all have the muscle to overcome adversity. 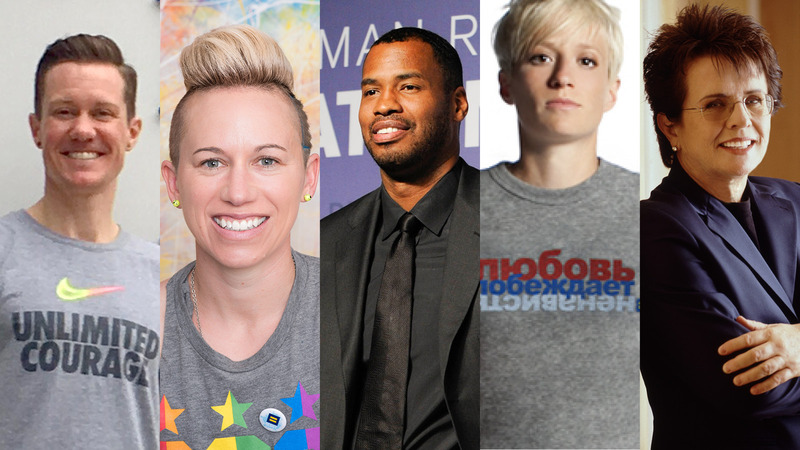 For LGBTQ History Month, HRC is honoring these pioneering athletes fighting for equality both on and off the field. Jason Collins: Retired NBA player Jason Collins came out in 2013, making him the first publicly LGBTQ professional athlete in any of the four major men’s pro sports leagues in the U.S. Since then, Collins has been a vocal advocate for LGBTQ equality, serving as an inspiration for other LGBTQ athletes and trailblazers who have come after him. Megan Rapinoe: As a member of the U.S. Women’s National Soccer team, Megan Rapinoe helped Team USA secure a gold medal at the 2015 FIFA Women’s World Cup and the 2012 London Olympics. Rapinoe came out as lesbian in 2012 and has since worked tirelessly for the rights of LGBTQ athletes. Rapinoe is a longtime HRC supporter, joining our #LoveConquersHate campaign in 2013 in support of Russia’s LGBTQ community. Joanna Lohman: Former member of the U.S. Women’s National Soccer Team and Washington Spirit midfielder/defender, Joanna Lohman has worked to advance the rights of LGBTQ athletes everywhere. She helped launch GO! Athletes, an organization that aims to create a safer space for all LGBTQ youth athletes in school, and also sported HRC’s logo in honor of several prides. Kye Allums: In 2010, Kye Allums became the first openly transgender NCAA Division I college athlete. Since his incredible basketball career, Allums has become a vibrant advocate for transgender rights and is a supporter of HRC’s work. Allums also founded I Am Enough, which encourages other LGBTQ individuals to come forward and talk about their own life experiences. In 2015 Allums was inducted into the National Gay and Lesbian Sports Hall of Fame. Layshia Clarendon: As a “biracial, black, gay, female, genderqueer and Christian” WBNA basketball player for the Atlanta Dream, Layshia Clarendon has proven to be a formidable force both on and off the court. Embracing the intersections of her identity, Clarendon is a vocal proponent for LGBTQ equality and regularly uses her platform to advocate for change. In August, Clarendon and fellow WNBA star, Brittney Griner, penned a powerful op-ed condemning the anti-transgender Texas bill, SB3. Billie Jean King: A legendary tennis player, advocate and Presidential Medal of Freedom awardee, Billie Jean King is often called one of the greatest tennis players of all time. Since coming out as lesbian in 1981, she has also been an avid advocate for LGBTQ rights in sports, receiving HRC’s National Equality Award in 2006. The story of her famous match with Bobby Riggs is told in the new movie Battle of the Sexes, featuring Steve Carell and Emma Stone. Billy Bean: Billy Bean is a former Major League Baseball (MLB) player, and the second MLB player to publicly come out as gay. In 2014, he also became the MLB’s first Ambassador for Inclusion, working to remove homophobia and transphobia in the sport. Bean has been a long-time supporter of HRC, and participated in a number of HRC panels and conferences about LGBTQ inclusion in sports. John Amaechi: John Amaechi, who shared his coming out story in a video for HRC, is the first former NBA player to publicly come out as gay. Amaechi has been an outspoken critic of homophobia in sports, and works to promote an inclusive and open environment for LGBTQ basketball players across the country. Robbie Rogers: After signing with the Los Angeles Galaxy in 2014, Robbie Rogers became the first openly gay male athlete in any of the five major North American sports leagues. In 2015, Rogers was inducted into the Gay and Lesbian Sports Hall of Fame. Brian Anderson: “It gets better,” professional skateboarder Brian Anderson said after coming out in September 2016. Based in Queens, N.Y., Anderson has long been a magnet for sponsors in the skateboarding world, but feared coming out would damage his reputation. Anderson continues to receive support from the LGBTQ community, especially the community of LGBTQ skateboarders. Bill Kennedy: Bill Kennedy is a professional basketball referee for the NBA. After Sacramento Kings guard Rajon Rondo’s stalked Kennedy on the court and allegedly made homophobic slurs toward him during a 2015 game in Mexico City, Kennedy publicly came out as gay, and became the second openly gay NBA official referee in history.